Six studies highlight new and unexpected insights into Ceres, a dwarf planet and the largest object in the asteroid belt (between Mars and Jupiter). The results, derived from data from the Dawn spacecraft in orbit around Ceres, reveal that it has craters, cracks, cryovolcanos and other markers of geological processes. Together, these studies provide a much-improved understanding of Ceres, a world of rock and ice. Previously, scientists have suggested that certain bodies in space could host volcanic activity, based on observed molten ices. However, evidence of such ice volcanos - called cryovolcanos - has remained elusive until now. Based on their analysis of Dawn imaging data, Ottaviano Ruesch and colleagues argue that they have identified a cryovolcanic formation on Ceres, named Ahuna Mons. The dome-shaped mountain has an elliptical base and a concave top, as well as other properties that indicate cryovolcanism. The authors applied models to determine the age of Ahuna Mons, finding it to have formed after the craters surrounding it, which suggests that it came into existence relatively recently. There is no evidence for compressional tectonism, nor for erosional features, the authors say; it appears that extrusion is a main driver behind the formation of Ahuna Mons. 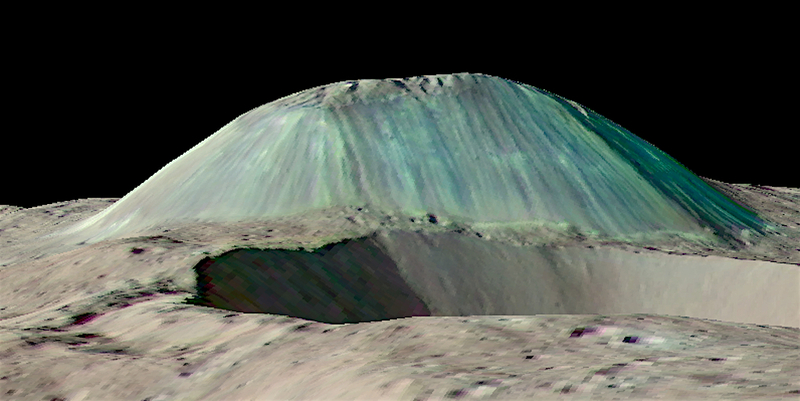 Although the exact material driving the cryovolcano cannot be determined without further data, the authors propose that chlorine salts, which have been previously detected in a different region of Ceres, could have been present with water ice below Ceres' surface and driven the chemical activity that formed Ahuna Mons.